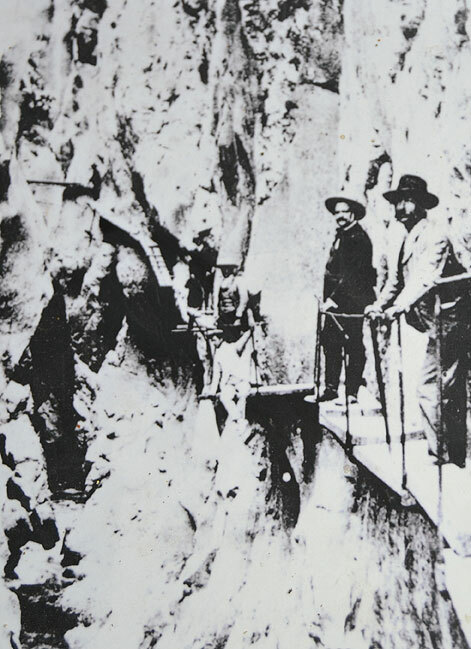 on steel rails supported by stanchions at around 45 degrees driven into the rock face and for many years was in a highly deteriorated state with numerous sections collapsed and large open air gaps bridged only by the narrow steel rails. 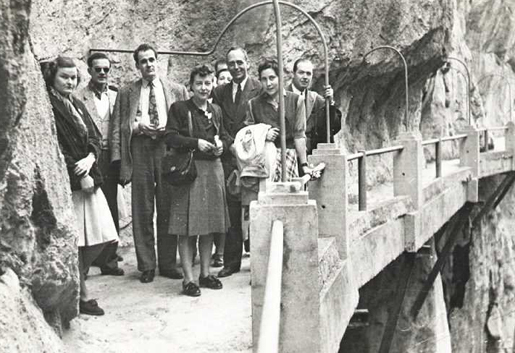 Very few of the original handrails existed but a safety-wire placed by climbers ran the length of the path. The area is a mecca for climbers and the Caminito del Rey became known as one of the most impressive and dangerous mountain trails in the world (as the many videos on you tube certainly demonstrate.) But, after several people lost their lives on the walkway (in 1999 and 2000) both access points were demolished by local authorities and access prohibited. In June 2011 the regional government of Andalusia and the local government of Málaga agreed to share the costs of a restoration project (including car parking and a museum) but even with a budget of €9 million euros,the project took approximately three years to start and only in March 2014 the restauration work began. 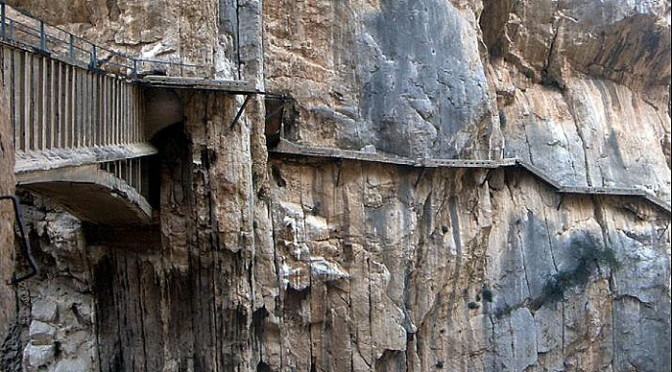 In its new upgraded and repaired state the Camino del Rey will have wooden and concrete flooring, glass-bottomed viewing and safety rails along the whole length. The official opening ceremony is scheduled for January or February 2015 and no other than King Felipe of Spain has been invited to open it. The word is that access will be free for the first few months and then a charge will be made for walking this amazing footpath. The charge has yet to be announced. Hi Ron….. Lots of rumors and mis-information floating about right now… It does seem that the Caminito del rey will open in February but the actual date has not been released yet. There will be a web based reservation system in place but the domain and system has not been published yet. Other Rumores to be confirmed…The first 6 months, entrance is said to be free and after that a charge will be made… Children under 10 will not be allowed to walk the Caminito….. helmets will be compulsory…. Will someone please point me to a website with walks descriptions in the area? 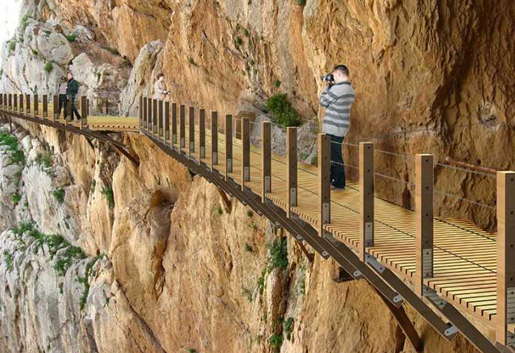 I should like to incorporate the Caminito del Rey in a 10 to 20 km hike if possible in mid May. Can anyone tell me how I can get tickets for the Caminito? I have looked on the website but it only has dats until the end of May 2015 and these are all booked. Hi Nikki…. Yes you are correct…. All of April and May is full and there are no places left.. The booking website says that the reservation system for June will open soon. 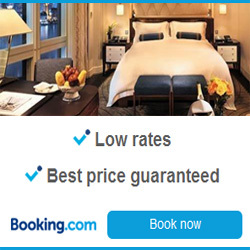 It is a question of checking every day to see if its taking bookings. H guys, I am wondering if there is a way to do a day trip to the Caminito Del Rey from Ronda as a day trip without a car? I looked into the train timetables, and there are only 2 trains, the morning one has a 6 hour stopover in Bobadilla which isn’t very helpful, and the other one leaves Ronda at 4.50pm! This will necessitate overnight stay in El Chorro, which wasn’t on our plans . Also, the train back to Ronda leaves in the middle of the day, so that isn’t helpful either- means another night in El Chorto. I understand that one only needs half a day for the Caminito. I migh just need to book a car from Ronda, but I wasn’t that keen to drive. All the organised day trips seem to go from Malaga, and we are not planning to go there at all. Any other ideas? Thanks so much!